Nestled in the Rocky Mountain Foothills fifteen miles west of Denver, there stands a symbol of nature's unparalleled majesty. Red Rocks is a geologically formed, open-air Amphitheatre that is not duplicated anywhere in the world. With Mother Nature as the architect, the design of the Amphitheatre consists of two, three hundred-foot monoliths (Ship Rock and Creation Rock) that provide acoustic perfection for any performance. The area of Red Rocks, originally known as the Garden of Angels, has attracted the attention of musical performers since before the turn of the century. The majestic setting of the Amphitheatre, along with the panoramic view of Denver, makes for a breathtaking scene. The Red Rocks Amphitheatre is a 9,000-seat natural outdoor arena carved out of huge, 500-foot (152 m) high, red sandstone cliffs, all overlooking Denver and the plains. With its views and geologic wonders, it’s one of the world’s most famous concert sites and has played host to everyone from the Beatles to symphony orchestras. Seventy million years ago, the rocks were the beach of an ancient inland sea that covered eastern Colorado and Kansas. Today, it's a wonderful site for hikes, picnics and concerts. In April 2006, the Colorado Tourism Office (CTO) appointed Red Rocks as the ninth official Colorado Welcome Center. The newly designated Welcome Center is housed in the “Trading Post” building at the base of Red Rocks Amphitheatre. Denver architect Burnham Hoyt designed the Amphitheatre with an emphasis on preserving the natural beauty of the area. The plans were completed in 1936, and the Amphitheatre was dedicated on June 15, 1941, though the actual construction spanned over 12 years. In 1947, the first annual Easter Sunrise Service took place. 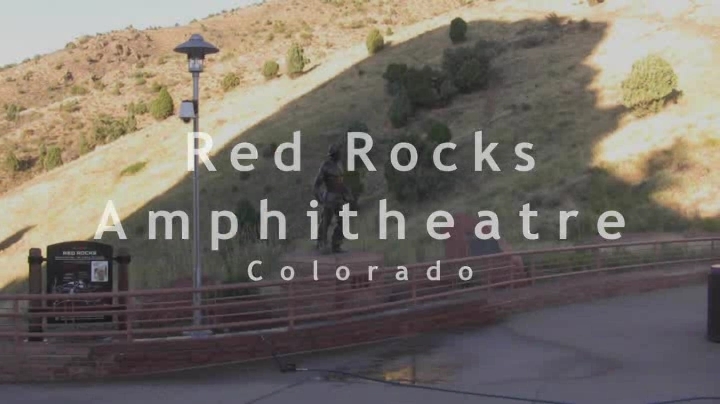 Since then, Red Rocks Amphitheatre has attracted the best performers to its stage. Red Rocks Amphitheatre is located in Red Rocks Park near Morrison, Colorado, 15 miles west of Denver. Coming from Downtown, take I-70 west to exit 259, turn left at the bottom of the Morrison exit ramp, cruise on downhill 1.5 miles to the Red Rocks Park entrance. Coming from south Denver, take C-470 to the Morrison exit, turn west and follow the signs to the Park entrances.